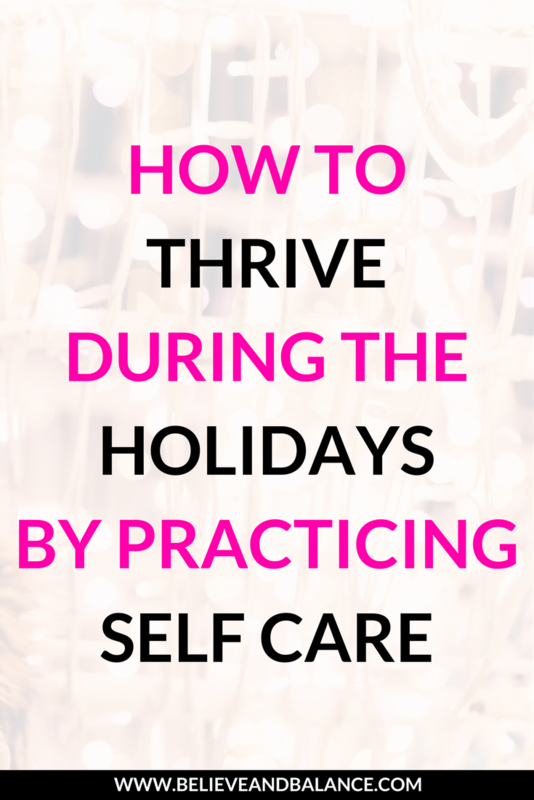 It is SO important to focus on your needs throughout the holidays so you can continue to utilize your self care plan, especially when things get stressful and chaotic. And, if you plan ahead (like I did), you can focus on feeling stress-free and relaxed while everyone around you does their own thing! Think about how great it would feel to be relaxed but also accomplished during this crazy time of year. Awesome, right? I'm sure you've heard me say this a million times throughout all of my blog posts, but I'm going to say it again... Self care is a very individualized practice that's unique to each person but there are plenty of self care basics that everyone can practice at their own pace. These basics include: healthy eating, exercise, healthy amount of sleep, relaxation built into your day, the right amount of time with others regardless of being an extrovert or introvert, self indulgence, experiencing meaningful moments, and saying daily affirmations. Trust me when I say that self care doesn't have to be complicated. It's what you make it. I'm a firm believer in living a life in which you have defined yourself. It's also essential to be a person who knows exactly what type of self care they need to nourish their mind, body, and soul. If you have the ability to continue to living a balanced and content life, why not utilize those skills every day, especially during the holidays. This past weekend, I wanted to take a moment to identify my needs since the holidays are quickly approaching. Essentially, I sat down and created a few lists in regards to mindset, self-care and complete self awareness so I can combat becoming overwhelmed with parties, dinners, and accomplishing everything on my to do list. Now, I want to share exactly what I did so you can try it yourself! Make a list of potential triggers that might make you feel stressed or overwhelmed over the next 2 months and things that are specifically related to the holidays. Make a list of ways you can change the possible trigger or stress from occurring. I don’t mean avoidance but finding another way of approaching it or planning for it. Make a final list of what your self care goals are going to be to avoid or relieve those situations. Know what is your current self care routine is and how will you incorporate that into each day. Once you complete all of your lists, do a brain dump and identify activities that you absolutely love doing (holiday related or not). Go through this list and find a few that you can incorporate to reduce the stress in your life. Tip: Be proactive with this and schedule these activities into your calendar too! Reading, running, gym time, baking or cooking, yoga, manicure, massage, long walks, facial, new haircut, shopping, photography, cookbooks, meditation, organizing, good foot scrubs, long hot bath, music, dancing, painting your nails, good meal, glass of wine, self affirmation readings, bible verses, notes on the mirror, quiet alone time, a glass of wine, time with partner, dinner with a friend, and maybe crafting. Practice self care every day and continue to adapt to your journey as it unfolds in front of you. Now, let's get back to the holidays for a second... They really can be stress free and more fun when you take care of yourself. If you have not been practicing self care this gives you a time and a place to start. Start by making some lists for yourself (as stated above) and start acting on them little by little. Keep a journal or invest in a planner to see how much better you feel throughout the process. Also, I would love to hear how you are doing with self care practices and what you do to promote self care. If you are just starting your journey, please keep me up to date on your progress. I will be taking on new coaching clients in 2018 and would love to work with you. If you're interested in exploring ways in which we can work together, start by scheduling a Discovery Call.